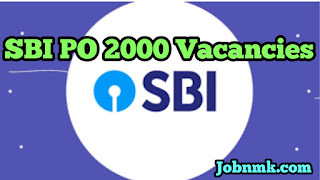 SBI PO Vacancies 2019. State Bank of India Has as usual published advertisement for 2000 Vacancy for SBI PO. SBI per year recruits Vacancies. Those who are interested in the vacancies and want to apply read detail notification before apply. Prelims Exam Date of SBI : 8th, 9th, 15th and 16th June 2019. Candidate at least must possess a Graduation Degree from any recognised University or college recognized by law in India. For General and UR Candidates minimum age 21 years to 30 years as on 01 Apr 2019. There will be age relaxation like 10 years for PWD candidates 05 years for SC and ST ccandidates. OBC candidates will get 3 year of age relaxation. Rupees 27,620 with 4 advance increments in the pay scale of ₹23700-980/7-30560-1145/2-32850-1310/7-42020 as mentioned in notification. The Selection of a candidate depends upon pre+main+interview marks. Mark’s of preliminary exam will not be counted in merit list. Click on button “Click here for New Registration” option if you are a new user on site. Let’s Complete the Registration form and Click on “Submit” option. After suscesssuc Registeration Login with registration number and password. Now, step by step upload all details such as photo, signature and education qualification.